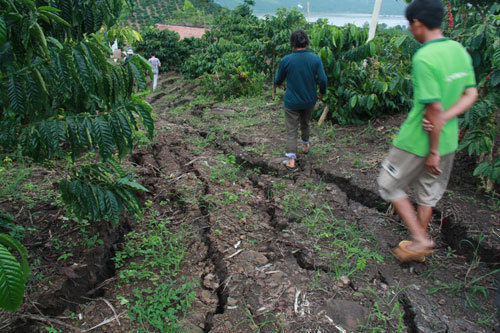 HOA BINH (VNS) — An initial investigation conducted by the Viet Nam Academy of Science and Technology and Institute of Geology has showed that the over use of underground water caused landslides in An Nghia Commune in Hoa Binh Province last month. The investigation included geological surveys undertaken in 30 locations within the commune in Lac Son District and about ten kilometers from the commune, said Dinh Van Toan, member of the academy's board. Remote sensing images have also been used to study the landslide, he said. Scientists from the two institutes plan to conduct further inspections in three months to gather more information on the landslide which took place on February 12. In the meantime, Toan warned residents to suspend their use of underground water. Temporary measures have been carried out at locations affected by the landslides including resident evacuations and road construction, said Bui Van Hanh, chairman of the district People's Committee. The district People's Committee had also banned the operation of coal mines in the area, he said. Bui Van Canh, head of the commune, said there are around ten sinkholes in the area as a result of the landslide. The landslide affected an area of four hectares and caused cracks along the inter-communal road and in the walls of several houses.